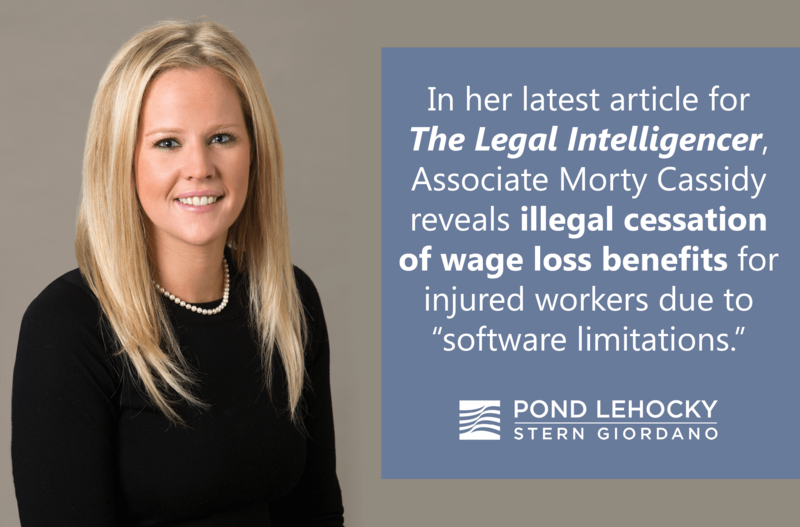 In her latest article for The Legal Intelligencer, “Do Software Limitations Trump the Act?” Pond Lehocky Attorney Maureen “Morty” Cassidy explains how workers’ rights are impacted by “Forms Solutions” in the Workers’ Compensation Automation and Integration System (WCAIS). “Yet in the most recent Forms Solution update, the middle step is eliminated and no Notice Stopping is being issued when the carrier chooses to deny the wage loss but accept the claim for medical purposes, leaving injured workers with an illegal cessation of wage loss benefits and employers that refuse to reinstate those benefits without any legal basis,” Ms. Cassidy reveals. Employers are claiming that because the WCAIS system’s software limitations don’t allow them to generate a Notice Stopping, their actions are somehow defensible. Ms. Cassidy argues that money saved by going electronic should not come at the cost of an injured workers’ rights. “In an already confusing claims process, this is another step to discourage injured workers from receiving benefits that may be entitled, without notice,” Ms. Cassidy explains.